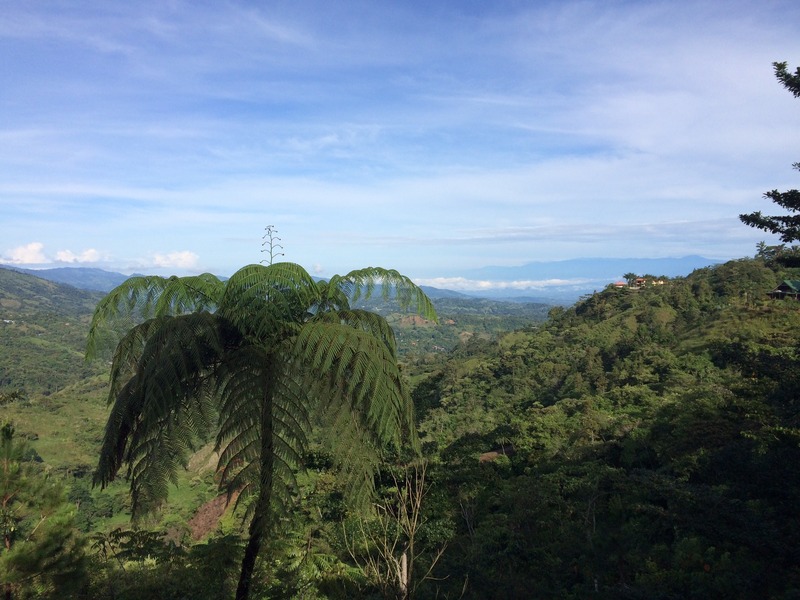 The jaw-dropping view of the Talamanca Valley from our patio at Casa Botania. The view changed constantly as the clouds and rain rolled in and out. With another three months having flown by, we just completed our second border run to Rio Sereno on the Panama/Costa Rica border and then on to San Vito, CR for a weekend of R&R. For the absolutely gripping, edge-of-your-seat account of our first trip, check out our previous post here. We’ll let that one explain the whats and whys of this particular rite of passage for new Panamanian expats. This time, we knew what we were doing and where we were going. In Rio Sereno, we drove straight to the secure parking lot across from the Costa Rica police building and then walked the hundred paces to Panama migración. Ten minutes and a vigorous stamp-stamp-stamping of our passports later, we were checked out of Panama and headed across the road to the Costa Rica point of entry. There the immigration officer had us fill out visa entry slips. You know the kind – the ones you fill on on a airplane just before landing in a foreign country – but these had been copied a hundred times and were barely readable (oddly, we had to fill out the exact same forms two days later to exit). The blank for “transit number,” meaning the flight number of the plane we’d be using to leave Costa Rica (umm . . .) gave us a slight panic moment when we realized we’d brought the wrong paperwork for our flight to the U.S. in November (we’d need this for clearing back into Panama, which requires foreigners to show a return ticket to their home country). For now, we gave them flight number of our in-country Copa flight to Panama City. Bada bing, and we were cleared into Costa Rica and on our way. Did I mention that all of this took place in a TORRENTIAL downpour? Well, it is late October, after all, the height of our rainy season. Next step – back across the rocky road to the bus station, where we had a 45-minute wait for the next bus to San Vito. So what do you do when you’re sitting in a torrential downpour in a little Panamanian border town, waiting for a Costa Rican bus? Have a Costa Rican cerveza, of course! The bus left EXACTLY on time to San Vito, and once again was only about $3.75 U.S. for both of us. The road had been graded and seemed a bit smoother this time, and once again we were struck by the beautiful rolling countryside – a mixture of dense jungle, second-growth forest, and cleared pasture – that’s so similar to the Panama landscape and yet somehow different. After a nice 45-minute trip through the little farm towns of San Marcos, Sabalito, and Lourdes, we were dropped off close to the main triangle in San Vito. A $5 taxi ride brought us to our lodging, Casa Botania, where we were warmly greeted in a pouring downfall by Kathleen, the co-owner, and her big umbrella. Once settled in, we enjoyed a couple of cervezas imported from Belgium, Kathleen’s birth country. After a chill Saturday morning, reading and enjoying the ever-changing view of the breathtaking Talamanca Valley from our patio, we taxied to a new lunch spot, Rancho Cabito. This is a large, open-air restaurant/bar/nightclub perched on another hillside with another fantastic view that is very popular with local citizens. We had a tasty (if rather pricey) lunch and chatted up Juan, one of the family members that owns the place. And as a bonus, we got a Costa Rican civics lesson in the form of a large political rally taking place on the restaurant’s back patio. It turned out to be a campaign launch for a Green Party candidate running for mayor, with lots of rousing speeches and very enthusiastic locals dressed in green and waving flags. We enjoyed this little slice of rural Costa Rican life. The gustatory high point of the trip was Saturday night, with a special dinner prepared just for us by Casa Botania co-owners Kathleen and Pepe. We should note that these two are well-known for their culinary skills and, until recently, had been operating their kitchen as a restaurant that was very popular with the locals. Currently they’re in the process of re-structuring their menu to be all-vegetarian and they won’t officially re-open for dinner until December – but, lucky for us, we got to sample some of the treats they’re working on for their new menu. The butternut squash soup, salad, chick-pea and lentil “meatballs,” and fettucine with fresh marinara sauce were fabulous, and finished with a heavenly maracuyá (passion fruit) mousse for dessert. Then Kathleen joined us for an after-dinner sampling of her dad’s home-made limoncello. A truly memorable evening! We can’t say enough about Casa Botania and its charming innkeepers. It’s not just the great service, excellent breakfast, and little details, like fresh-ground Costa Rican coffee in every room. We also learned more about Pepe and Kathleen’s commitment to living a clean, earth-friendly lifestyle that is reflected in their service (the upcoming new vegetarian menu is one example). They have just planted a covered, organic vegetable garden that will eventually supply their restaurant, and Saturday morning Pepe was preparing to take their little four-year-old son, Elias, down to show him how to plant seeds. “I want him to grow up knowing how to feed himself and his family, and how to grow food that he can share with others. Someday soon, we’ll all need those skills,” he said. These are people after my heart! Sunday morning, we said our goodbyes and did everything in reverse for our trip home. Taxi to bus station, bus back to Rio Sereno, trip to the little hardware store to purchase our $8 exit stamps for Costa Rica. Exiting took a bit longer at CR migración thanks to a very drunk guy who seemed to have a big problemo trying to enter the country. Once that was settled, we cleared out within five minutes. Over at Panama migración we encountered a long line of indigenous workers that were either clearing out of Panama or trying to enter, all migrants looking for work in the upcoming coffee harvest. We dutifully took our place at the end of the line, only to be waved in a few minutes later by the immigration officer. We did NOT feel good about jumping the line ahead of all these folks, but the officer was insistent. Unlike our first border crossing, this time we had to show a plane ticket or some evidence that we had booked travel back to the U.S. (thankfully Kathleen had printed out our November itinerary for us) and proof that we had at least $500. We had brought cash but were able to show our local Panamanian bank statement, and that was good enough. Bada bing, stamp stamp, and we were home in Panama. The jaw-dropping view from our patio, Casa Botania. It was constantly changing as the clouds and rain rolled in and out. Kathleen in her kitchen. Yes, the bread was amazing! We loved this store at the border. Just the place if you need a straw reindeer, a guitar, some fertilizer or some pots and pans! As the coffee harvest approaches, Rio Sereno is filled with indigenous workers. These Ngobe ladies are hard to miss in their bright dresses. You have it down and amazingly simple and efficient. I still remember driving by truck from Baja to Costa Rica…..truly great trip with the border crossings from hell. Vegetarian, a couple after my own heart 🙂 I’ll take a look at their website to what’s offered. Thank you for the update! It really is a special place, owned by special people!